Now it makes sense that I would get that wrong, because it’s pretty much what us Christians do when our spiritual life takes a dive. After drifting for awhile we will usually come to the place where we realize that something’s not right, that we’re not at the same place that we used to be in our spiritual life. It’s kind of like the person who puts a raft out in the water and goes to sleep in the hot sun. Sometimes we wake up and don’t know where in the world we are! We’ve drifted. Now if you do that in the ocean it can actually be pretty dangerous. You look around and you have no landmarks- you’re lost with no clue how to get back home. Well, our spiritual life is like that- we can take a nap and drift, and sometimes for a very long time. When we finally come to our senses and begin to wake up, it can be confusing. 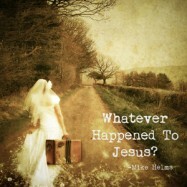 “What happened, Lord? Where’s your power? Why do I feel so weak and empty?” We can remember what it used to be like, but it’s not like that anymore- we’re someplace else and we don’t quite know how to get back to the place where we started. I think the story of Samson and Delilah is a good illustration of what happens when we drift from the Lord. What was Samson’s real problem? Okay, Samson’s not exactly a beacon of purity here! This is the kind of thing he was doing before he ever ran into Delilah. Sure, falling in love with Delilah wasn’t his best move, but Samson was a guy who had already been drifting. So Samson drifted right into the arms of a woman who wasn’t good for him. Now this woman was toying with Samson and he knew it, but he played along. Samson was used to toying with sin and Delilah probably seemed no worse than any other thing he’d been tempted with in the past. As we all know, when we toy with sin it’s only a matter of time before we get caught in it and we’re ensnared. Delilah turned out to be more than Samson bargained for, however! He’d been drifting, toying with sin and playing a dangerous game with Delilah, and in the course of it he broke his consecration to God. He woke up and thought, “Today will be like any other day”, but he was very wrong! The Lord has left him and he was POWERLESS. But it was never about POWER, it was always about RELATIONSHIP. How awesome is that? Our failure is not the end of relationship. God was not done with Samson! We know how the story ends- God does remember Samson and grants his request. Samson takes out the Philistines and sacrifices himself in the process. How much better it would have been if Samson had just stayed true to God! But let’s be honest, all of us have drifted from time to time and to various degrees. In our own way we suffer for it, too. We find ourselves dazed and confused and imprisoned if only within ourselves- we end up being not what we used to be, something less than what we could have been. The lesson learned is that we have no true life apart from God; our relationship with Him is EVERYTHING. But maybe we don’t have to drift so far out to sea as Samson did; hopefully we don’t need to have our eyes gouged out to be able to see that we’re blind! The real question is not, “Where’s the power, Lord?” it’s “Where’s the relationship?” It’s not about whether God uses us or not for His service, or does things for us in our lives, it’s about the fact that we’re His CHILDREN- it’s always about relationship. And because it is about relationship we can have hope to turn things around, because He is our Father and we are His sons and daughters. His older brother couldn’t believe that their father was actually taking this loser brother of his back. Even more than this, his dad was throwing his brother a party! What in the world was going on here? Hadn’t his brother totally messed up and blown all his father’s inheritance? Does he really deserve a party? Instead of being happy that his brother had returned home he was angry and jealous that his dad was actually celebrating his safe return. You can hear the derision, can’t you? He calls his brother, “that son of yours”, instead of “my brother” and is angry about the fact that he and his father worked day in and day out for “the calf we’ve fattened” only to have his brother eat it at a party he didn’t deserve. Now, let me stop to just say very quickly that if you’re a Christian who’s messed up your life not everybody in the church is going to be happy to see you’re back or be excited about your return! It’s sad, but true. Many Christians are like the prodigal’s older brother- a little too self righteous and without enough of their Father’s heart. Don’t let that worry you. Your Father has open arms and will receive you; any brothers and sisters who give you the cold shoulder will just have to come around. This story is about our Heavenly Father and how he relates to His children. “He ran and fell on his neck and kissed” his rebellious son as soon as He saw him coming home! He didn’t shame him, or berate him, or point out his sin, or put him on parole to see if he was really going to be a better person now that he had returned home. The Father celebrated his return and let him know in the biggest way possible that he was still His son and part of the family. If you’re asking God where His power has gone, what you’re really asking is, “Where’s our relationship?” Don’t let your pride get in the way of returning home. Your Father has open arms and will be glad you’re back. “Where’s The Power Lord” is available here on iTunes.